Anna Mary Robertson Moses (September 7, 1860 – December 13, 1961), known by her nickname Grandma Moses, was an American folk artist. She began painting in earnest at the age of 78 and is often cited as an example of an individual who successfully began a career in the arts at an advanced age. Her works have been shown and sold in the United States and abroad and have been marketed on greeting cards and other merchandise. Moses' paintings are displayed in the collections of many museums. Sugaring Off was sold for US $1.2 million in 2006. Moses appeared on magazine covers, television, and in a documentary of her life. She wrote an autobiography (My Life's History), won numerous awards, and was awarded two honorary doctoral degrees. The New York Times said of her: "The simple realism, nostalgic atmosphere and luminous color with which Grandma Moses portrayed simple farm life and rural countryside won her a wide following. She was able to capture the excitement of winter's first snow, Thanksgiving preparations and the new, young green of oncoming spring... In person, Grandma Moses charmed wherever she went. A tiny, lively woman with mischievous gray eyes and a quick wit, she could be sharp-tongued with a sycophant and stern with an errant grandchild." She was a live-in housekeeper for a total of 15 years, starting at 12 years of age. One of her employers noticed her appreciation for their prints made by Currier and Ives, and they supplied her with art materials to create drawings. Moses and her husband began their married life in Virginia, where they worked on farms. In 1905, they returned to the Northeastern United States and settled in Eagle Bridge, New York. The couple had ten children, five of whom survived infancy. She expressed an interest in art throughout her life, including embroidery of pictures with yarn, until arthritis made this pursuit too painful. 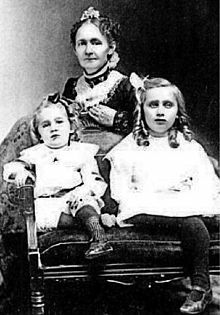 Anna Mary Robertson was born in Greenwich, New York on September 7, 1860; she was the third of ten children born to Margaret Shanahan Robertson and Russell King Robertson. She was raised with four sisters and five brothers. Her father ran a flax mill and was a farmer. As a child, Moses attended a one-room school for a short period of time. That school is now the Bennington Museum in Vermont, which has the largest collection of her works in the United States. She was inspired to paint by taking art lessons at school. Moses first painted as a child, using lemon and grape juice to make colors for her "landscapes". Other natural materials that she used to create works of art included ground ochre, grass, flour paste, slack lime and sawdust. At 12 years of age, she left home and began to work for a wealthy neighboring family, performing chores on their farm. She continued to keep house, cook and sew for wealthy families for 15 years. One of the families that she worked for—the Whitesides—noticed her interest in their Currier and Ives prints and purchased chalk and wax crayons so that she could create her own artwork. Five of the ten children born to them survived infancy. Although she loved living in the Shenandoah Valley, in 1905 Anna and Robert moved to a farm in Eagle Bridge, New York at her husband's urging. When Thomas Moses was about 67 years of age in 1927, he died of a heart attack, after which Anna's son Forrest helped her operate the farm. Anna Moses never married again. She retired and moved to a daughter's home in 1936. 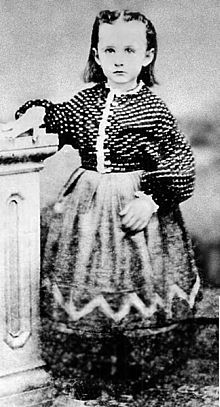 Anna Mary was known as either "Mother Moses" or "Grandma Moses," and although she first exhibited as "Mrs. Moses," the press dubbed her "Grandma Moses," and the nickname stuck. As a young wife and mother, Moses was creative in her home; for example, in 1918 she used housepaint to decorate a fireboard. Beginning in 1932, Moses made embroidered pictures of yarn for friends and family. She also created beautiful quilted objects, a form of "hobby art"[nb 2] as defined by Lucy R. Lippard. By the age of 76, Moses had developed arthritis, which made embroidery painful. Her sister Celestia suggested that painting would be easier for her, and this idea spurred Moses's painting career in her late 70s. [nb 3] When her right hand began to hurt, she switched to her left hand. What appeared to be an interest in painting at a late age was actually a manifestation of a childhood dream. With no time in her difficult farm-life to pursue painting, she was obliged to set aside her passion to paint. At age 92 she wrote, "I was quite small, my father would get me and my brothers white paper by the sheet. he liked to see us draw pictures, it was a penny a sheet and lasted longer than candy." It was her father's encouragement that fed her passion to paint and this dream was able to manifest later in her life. Moses painted scenes of rural life from earlier days, which she called "old-timey" New England landscapes. Moses said that she would "get an inspiration and start painting; then I'll forget everything, everything except how things used to be and how to paint it so people will know how we used to live." From her works of art, she omitted features of modern life, such as tractors and telephone poles. Her early style is less individual and more realistic or primitive, despite her lack of knowledge of, or perhaps rejection of, basic perspective. Initially she created simple compositions or copied existing images. As her career advanced she created complicated, panoramic compositions of rural life. She was a prolific painter who generated over 1,500 canvasses in three decades. Moses initially charged $3 to $5 for a painting, depending upon its size, and as her fame increased her works were sold for $8,000 to $10,000. Her winter paintings are reminiscent of some of the known winter paintings of Pieter Bruegel the Elder, although she had never seen his work. A German fan of her work said, "There emanates from her paintings a light-hearted optimism; the world she shows us is beautiful and it is good. You feel at home in all these pictures, and you know their meaning. The unrest and the neurotic insecurity of the present day make us inclined to enjoy the simple and affirmative outlook of Grandma Moses." During a visit to Hoosick Falls in 1938, Louis J. Caldor, an art collector who worked as an engineer in the state of New York, discovered paintings made by Moses in the window of a drug store. He bought their supply and ten more from her Eagle Bridge house for $3 or $5 each. The next year, three Grandma Moses paintings were included in New York's Museum of Modern Art exhibition entitled "Contemporary Unknown American Painters". Her first solo exhibition, "What a Farm Wife Painted," opened in the same city in October 1940 at Otto Kallir's Galerie St. Etienne. A meet-and-greet with the artist and an exhibition of 50 paintings at Gimbel's Department Store was held next on November 15. Her art displays included samples of her baked goods and preserves that won Moses prizes at the county fair. Her third solo show in as many months, was held at the Whyte Gallery, Washington, D.C. In 1944, she was represented by the American British Art Center and the Galerie St. Etienne, which increased her sales. Her paintings were exhibited throughout Europe and the United States over the next 20 years. Otto Kallir established the Grandma Moses Properties, Inc. for her. The paintings of Grandma Moses were used to publicize American holidays, including Thanksgiving, Christmas and Mother's Day. [nb 4] During the 1950s, her exhibitions broke attendance records around the world. Art historian Judith Stein noted: "A cultural icon, the spry, productive nonagenarian was continually cited as an inspiration for housewives, widows and retirees." Her paintings were reproduced on Hallmark greeting cards, tiles, fabrics, and ceramics. They were also used to market products, like coffee, lipstick, cigarettes, and cameras. In 1950, the National Press Club cited her as one of the five most newsworthy women and the National Association of House Dress Manufacturers honored her as their 1951 Woman of the Year. At age 88, Mademoiselle magazine named Grandma Moses a "Young Woman of the Year." She was awarded two honorary doctoral degrees. The first was bestowed in 1949 from Russell Sage College and the second two years later from the Moore College of Art and Design. President Harry S. Truman presented her with the Women's National Press Club trophy Award for outstanding accomplishment in art in 1949. Jerome Hill directed the 1950 documentary of her life, which was nominated for an Academy Award. In 1952, she published My Life's History, her autobiography. In it she said "I look back on my life like a good day's work, it was done and I feel satisfied with it. I was happy and contented, I knew nothing better and made the best out of what life offered. And life is what we make it, always has been, always will be." In 1955, she appeared as a guest on See It Now, a television program hosted by Edward R. Murrow. She was a member of the Society of Mayflower Descendants and Daughters of the American Revolution. Her 100th birthday was proclaimed "Grandma Moses Day" by New York Governor Nelson Rockefeller. LIFE magazine celebrated her birthday by featuring her on its September 19, 1960, cover. The children's book Grandma Moses Story Book was published in 1961. Grandma Moses died at age 101 on December 13, 1961 at the Health Center in Hoosick Falls, New York. She is buried there at the Maple Grove Cemetery. President John F. Kennedy memorialized her: "The death of Grandma Moses removed a beloved figure from American life. The directness and vividness of her paintings restored a primitive freshness to our perception of the American scene. Both her work and her life helped our nation renew its pioneer heritage and recall its roots in the countryside and on the frontier. All Americans mourn her loss." After her death, her work was exhibited in several large traveling exhibitions in the United States and abroad. 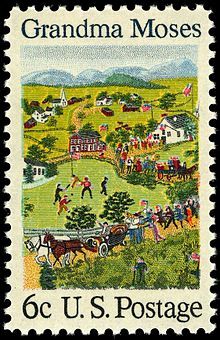 The 1969 U.S. postage stamp honoring Grandma Moses. It re-creates her painting Fourth of July, which the White House owns. A 1942 piece, The Old Checkered House, 1862 was appraised at the Memphis 2004 Antiques Roadshow. It was not as common as her winter landscapes. Originally purchased in the 1940s for under $10, the piece was assigned an insurance value of $60,000 by the appraiser, Alan Fausel. In November 2006, her 1943 work Sugaring Off became her highest-selling work at US $1.2 million. Otto Kallir of the Galerie St. Etienne gave Grandma Moses' painting Fourth of July (1951) to the White House as a gift in 1952. The painting also appears on a U.S. commemorative stamp that was issued in Grandma Moses' honor in 1969. The character Daisy "Granny" Moses, played by actress Irene Ryan on the popular 1960s rural comedy television series The Beverly Hillbillies was named as an homage to Grandma Moses, who died shortly before the series began. Norman Rockwell and Grandma Moses were friends who lived over the Vermont-New York state border from each other. Moses lived in Eagle Bridge, New York and after 1938 the Rockwells had a house in nearby Arlington, Vermont. 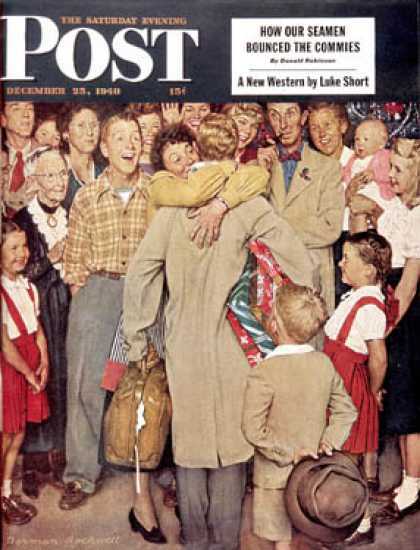 Grandma Moses appears on the far left edge in the Norman Rockwell painting Christmas Homecoming, which was printed on The Saturday Evening Post's December 25, 1948 cover. National Museum of Women in the Arts, Washington D.C.
^ Mount Airy near Verona, Virginia was listed on the National Register of Historic Places in 2012. Having bought the house in January 1901, it was the first residence the family owned. They lived there until September 1902. ^ Lippard stated in "The Word in Their Hands" that she found "hobby art" to be "an activity so 'low' on the art lists that it still ranks way below 'folk art...'" She further found that hobby art often involves reuse of otherwise discarded objects. ^ Grandma Moses also told reporters that she turned to painting in order to create the postman's Christmas gift, seeing as it "was easier to make [a painting] than to bake a cake over a hot stove." Being practical, painted works would last longer than her embroidered compositions made of worsted wool, which risked being eaten by moths. Judith Stein noted that "her sense of accomplishment in her painting was rooted in her ability to make 'something from nothing.'" ^ A Mother's Day feature in True Confessions (1947) written by Eleanor Early noted how "Grandma Moses remains prouder of her preserves than of her paintings, and proudest of all of her four children, eleven grandchildren and four great-grandchildren." ^ a b c d e f g h i j k l m "Obituary: Grandma Moses Is Dead at 101; Primitive Artist 'Just Wore Out'". New York Times. December 14, 1961. 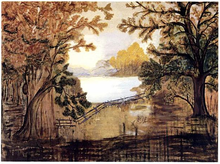 ^ a b c d e f g h i j k l m n "Anna Mary Robertson ("Grandma") Moses Biography". Galerie St. Etienne. Retrieved August 30, 2014. ^ Christina Tree; Diane E. Foulds (1 June 2009). Explorer's Guide Vermont. Countryman Press. p. 123. ISBN 978-1-58157-822-5. ^ a b c Arnold B. Cheyney (1 January 1998). People of Purpose: 80 People Who Have Made a Difference. Good Year Books. p. 110. ISBN 978-0-673-36371-8. ^ "National Register of Historic Places Program: Women's History Month Feature 2013 - Mt. Airy, Augusta County, Virginia". National Park Service. Retrieved August 30, 2014. ^ Amy Ross Moses (March 2012). "National Register of Historic Places Inventory/Nomination: Mount Airy" (PDF). p. 8. ^ "National Register of Historic Places Listings". Weekly List of Actions Taken on Properties: 8/20/12 through 8/24/12. National Park Service. 2012-08-31. ^ a b c "Grandma Moses in the 21st Century (originally published in Resource Library Magazine.)". Traditional Fine Arts Organization Inc. Retrieved August 6, 2011. ^ a b c d e f g h i j Stein, Judith (2001). The White-Haired Girl: A Feminist Reading: Grandma Moses in the 21st Century. Alexandria, VA: Art Services International. pp. 48–63. ^ Paul Arnett; William Arnett (2000). Souls Grown Deep: The tree gave the dove a leaf. Tinwood Books. p. 282. ISBN 978-0-9653766-0-0. ^ Moses, Grandma (1998). People Weekly (Special Collectors ed.). New York, NY: Time, Inc. Home Entertainment. p. 120. ^ "Grandma Moses (Anna Mary Robertson Moses) 1860–1961". National Museum of Women in the Arts. Retrieved August 30, 2014. ^ Zimmer, William (1998-07-26). "ART; The Varied Tradition of Grandma Moses". The New York Times. Retrieved 2010-05-04. ^ American Council of Learned Societies (1959). Dictionary of American Biography. Scribner. p. 557. ISBN 978-0-684-16794-7. ^ a b Metropolitan Museum of Art (New York, N.Y.); Doreen Bolger; Doreen Bolger Burke (1980). American Paintings in the Metropolitan Museum of Art: A catalogue of works by artists born between 1846 and 1864. Vol. 3. Metropolitan Museum of Art. p. 390. ISBN 978-0-87099-244-5. ^ Karal Ann Marling (2006). Designs on the Heart: The Homemade Art of Grandma Moses. Harvard University Press. p. 102. ISBN 978-0-674-02226-3. ^ a b Early, Eleanor (May 1947). "Just a Mother". True Confessions: 47. ^ a b "1942 Grandma Moses Painting". PBS. Retrieved August 30, 2014. ^ Gallagher, BJ (11 February 2014). It's Never Too Late to Be What You Might Have Been: A Guide to Getting the Life You Love. Cleis Press. p. 105. ISBN 978-1-936740-69-7. ^ Martin Bjergegaard; Jordan Milne (1 May 2014). Winning Without Losing: 66 strategies for succeeding in a business while living a happy and balanced life. Pine Tribe Limited. p. 180. ISBN 978-0-9912609-7-3. ^ Richard L. Lewis & Susan Ingalls Lewis, The Power of Art (rev. 3rd ed. : Centgage Learning, 2013), p. 22. ^ a b Schubert, Sunny (April 27, 2012). "View from the Pier: Brushing up on some art with Vino and Van Gogh". The Herald-Independent. Retrieved August 30, 2014. ^ Saloman, Deborah (November 1, 2013). "Norman Rockwell's New England". The New York Times. Retrieved August 30, 2014. ^ Karal Ann Marling (2006). Designs on the Heart: The Homemade Art of Grandma Moses. Harvard University Press. p. 182. ISBN 978-0-674-02226-3. ^ Karal Ann Marling (2006). Designs on the Heart: The Homemade Art of Grandma Moses. Harvard University Press. pp. 189, 284. ISBN 978-0-674-02226-3. ^ "Norman Rockwell's Christmas Homecoming cover of the Saturday Evening Post". coverbrowser.com. Retrieved August 30, 2014. ^ "Museum Story". Bennington Museum. Retrieved August 30, 2014. ^ "Collections". Bennington Museum. Retrieved August 30, 2014. ^ "Anna Mary Robertson Moses". Brooklyn Museum. Retrieved August 30, 2014. ^ "Artists - M - page 4". Figge Art Museum. Retrieved August 30, 2014. ^ "Search: Grandma Moses". Hirshhorn. Retrieved August 30, 2014. ^ "Search: Anna Moses". Lauren Rogers Museum of Art. Retrieved August 30, 2014. ^ "Search: Moses". Maier Museum of Art, Randolph College. Retrieved August 30, 2014. ^ "Search: Anna Moses". Memorial Art Gallery, University of Rochester. Retrieved August 30, 2014. ^ "Search: Grandma Moses". Metropolitan Museum of Art. Retrieved August 30, 2014. ^ "Grandma Moses". National Museum of Women in the Arts. Retrieved August 30, 2014. ^ "Collection - Artists L-M". The Phillips Collection. Retrieved August 30, 2014. ^ "SAAM - Grandma Moses". ^ "Grandma Moses". University of Iowa Museum of Art. Retrieved August 30, 2014. ^ a b c d e f Adam Richard Schaefer (2003). Grandma Moses. Heinemann Library. pp. 5–13. ISBN 978-1-4034-0289-9. ^ a b c d e f g h i j k l m n o Karal Ann Marling (2006). Designs on the Heart: The Homemade Art of Grandma Moses. Harvard University Press. p. throughout. ISBN 978-0-674-02226-3. ^ "SAAM - Christmas by Grandma Moses". ^ "SAAM - Grandma Moses Goes to the Big City". ^ a b c V. T. Dacquino (1 January 2010). Grandma Moses. Benchmark Education Company. pp. 12–17. ISBN 978-1-61672-617-1. ^ a b Metropolitan Museum of Art (New York, N.Y.); Doreen Bolger; Doreen Bolger Burke (1980). American Paintings in the Metropolitan Museum of Art: A catalogue of works by artists born between 1846 and 1864. Vol. 3. Metropolitan Museum of Art. pp. 391–392. ISBN 978-0-87099-244-5. Wikimedia Commons has media related to Grandma Moses. Jane Kallir, "Grandma Moses: The Artist Behind the Myth", The Clarion, Fall 1982. This page was last edited on 2 April 2019, at 10:12 (UTC).